Oh, what a lovely keepsake for a very special child. 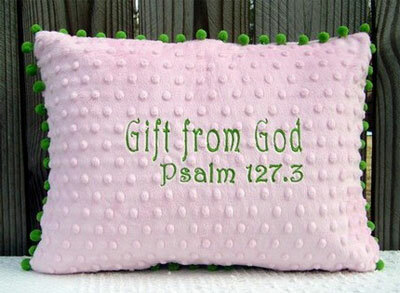 This super soft and cuddly minky dot 12" x 16" pillow is beautifully embroidered with "Gift from God", Psalm 127.3 and is trimmed with pom-pom fringe on all 4 sides. Envelope style sham opens in the back to allow for easy removal of the pillow (which is included) to wash the cover. 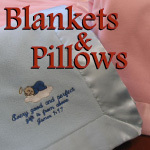 This pillowcover has been carefully hand crafted in a smoke-free home, using only the finest materials available, with close attention being paid to every detail. Pillow insert included! Pom-pom fringe is not suitable for children age 3 and under to play with.